Pastiche of Michelangelo’s The Creation of Adam , a modern reworking inspired by the same exercise I carried out twenty years ago. Tomorrow is the referendum on Britain’s membership of the European Union. I’ve wanted to write about this for some time, but I’ve delayed and delayed in the hope I could offer a tidy summary and clear reasoning behind my decision to remain. The question on the ballot paper demands a simple black or white answer, yet a study of the issues only offers shades of grey. How can I navigate such a complex subject, one distorted by years of inaccurate and biased reporting? How should I approach a subject that can generate emotive reactions, or much worse, as evidenced by the tragic murder of Jo Cox MP. Writing anything about the referendum feels so contentious, that I feel an immense pressure to write something that is balanced yet convincing. I have so much I want to say, yet little time left to say it. Where do I even start? Maybe I should just start at the beginning. Born 35 years ago to a middle-income family (dad a telecom engineer, mum a dinner lady), I grew up on a new housing estate in suburban Surrey. Idyllic maybe, average certainly, although less so when aged 13, my family moved to the West Midlands. Quite a contrast, and the first of many relocations that would offer a new perspective. A comfortable upbringing meant I had little reason to disbelieve the contents of the Daily Mail, the newspaper my parents read at the time. While I don’t recall being an avid reader, its editorial must have had some effect: asked to create a pastiche of a famous painting for a GCSE art project, I reworked Michelangelo’s The Creation of Adam to show Britain figuratively holding back the forces of Europe. Two decades on, I find this work embarrassing, yet it serves as a reminder of the political journey I’ve been on since. Its leftwards shift can be traced back to the short period I lived in the United States: working abroad, and alongside a mix of nationalities, broadened my world view significantly. Today, my political centre of gravity lies somewhere around the centre. A floating voter at the start of the referendum campaign, I expected to face a head versus heart decision, perhaps taming an urge to vote leave and shake things up a bit. I provide this background because it’s important to remember that we all bring our own perspectives and biases to this debate. Too often there’s been a tendency to group people together: if the media isn’t dividing the electorate into awkward portmanteaus like Brexiteer or Bremainer, then campaigners have sought to talk in terms of us and them. When I stop to think about what Europe has or hasn’t done for me, I have little to complain about, but then I have little to complain about anyway. My life is pretty uncomplicated, a situation born of comparative privilege and stable upbringing. Not everyone is so lucky, which is why societal safeguards — supporting the cost of higher education, providing social housing, ensuring healthcare is free at the point of use — should be strengthened, not diminished in pursuit of an ignorant political ideology. The government’s policy of aggressive austerity has placed increased pressure on public services be that by underfunding its institutions or undermining its servants. Yet this referendum has perpetuated a narrative in which the blame has been pinned on others, be they European bureaucrats, Polish immigrants or Syrian refugees. At the start of the campaign I found some of the arguments fascinating, not least those that focused on democracy, self-government and abstract notions of sovereignty. I found others tiresome, especially when used as a proxy for leadership of the Conservative Party. As the debate wore on, my opinion solidified, particularly as Vote Leave’s deception became obvious: employing dark patterns on its website, posting leaflets claiming to be “official election information” or placing an outright lie on the side of their battle bus — all while allowing experts to become a derogatory term. The remain campaign wasn’t much fun either. If George Osbourne wasn’t releasing dubious Treasury statistics, then David Cameron was shooting himself in the foot. The spotlight rarely fell on other voices within the much broader coalition of remain advocates. As some leave campaigners grew increasingly xenophobic and the remain camp continued with its strategy of fear mongering, examination of the organisation whose membership we were being asked to vote on was sorely missing. Step away from the argument for five minutes to look at the detail, you soon realise that many of our complaints are either self-inflicted or entirely made up. Is Europe perfect? Far from it. Could it be more democratic? Certainly — but then so could Britain. The EU’s pursuit of a free-trade agreement with the United States (TTIP) is deeply concerning, and it’s being advanced by politicians on both sides of the debate. Surely better to negotiate such a deal as part of a trading block of 500 million consumers, than be steamrollered into one done on the basis of the “special relationship”, and we know which direction that usually operates. What could we achieve inside Europe if instead of complaining, obstructing and abstaining, we took a more proactive and positive role? 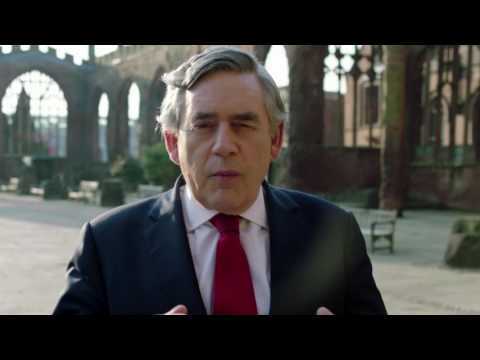 Gordon Brown: Lead not Leave. The week I’m asked to decide on Britain’s future relationship with Europe, I find myself visiting a small part of it. As I’ve walked around Amsterdam and Utrecht, I’ve seen people bathing in the sunshine or dodging the frequent and heavy rain showers, generally enjoying a peaceful lifestyle we’ve grown accustomed to. It’s one we take for granted. In commemorating the centenary of the first world war and with cessation of the second 70 years behind us, we should remember that peace is not the default setting. Europe has experienced war in every century bar this one; what would it take to change that? Could Brexit be the catalyst? History doesn’t repeat itself, but it does rhyme. In the aftermath of a deep economic depression, right-wing extremism is again finding a foothold within Europe — and in the United States. Meanwhile, Russia sits on the sidelines, encouraging instability and devision by whatever means necessary. Forget breaking point, this year looks more like a tipping point. Given this situation, why make a decision that could have seismic consequences? Why spend the next ten years negotiating trade deals and our relationship with Europe, when instead we could be combating climate change, encouraging stability in Syria and the Middle East and soothing relations with Russia? A vote to remain means we still have the option to leave in the future, and future European treaties require a referendum before Britain can them anyway. A vote to leave is irreversible and potentially damaging. I thought I would be voting for the least worst option. Yet over the last few weeks, watching the dynamics within the various leave campaigns play out, I’ve seen that allowing deceptive and careless voices emerge as the most powerful and influential is far worse than opting for the status quo. I thought this referendum would come down to a choice between my head and my heart. I now see it as a choice between selfishness or solidarity; isolation or co-operation; ideology or pragmatism, xenophobia or internationalism. There is so much at stake. And there’s still so much more I want to say. But for me the reasons for voting to remain in Europe are now crystal clear.